INTERNET access provides a powerful tool to communicate electronically with members, our three branches of state and national governments, and others to urge them to hear our message. The opportunity to disseminate educational material, advocate for citizens' rights and endeavor to reform current laws, as necessary, can happen quickly and with short notice. As you visit and browse the pages of our Web site, you'll learn how our organization will conduct business and how we intend to accomplish our goals and objectives. Before concluding your tour don't forget to sign up to join as a member or subscribe to our e-mail list. Your comments and suggestions are appreciated. 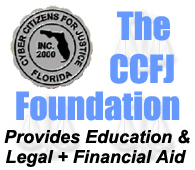 You'll learn: CCFJ is a Cyberspace organization intent upon making "We The People" instrumental in beneficially influencing government and improving the political, economic and social aspects affecting the lives of Florida citizens. As we become better known and our membership continues to grow PEOPLE POWER will become more evident. Someone once said; "In Unity There is Strength!" We believe that's absolutely true! Therefore, as you and your friends and neighbors unite as members to seek consensus for worthwhile causes, we'll have a profound effect upon the outcome of "good public policy" emanating from our government and the protection of the "health, welfare and safety" of the citizens of our state. In the absence of unity, the efforts of citizens are fragmented by competing political parties, organizations, and the power and influence of lobbyists at various levels of government. Thus, many citizens are uninvolved and/or apathetic. They have no one to turn to for assistance. CCFJ intends to fill that void and become the catalyst which will motivate our members to insist upon a government "...of, by and for the people..."! Yes, our organization will become the rallying point to bring people together in a spirit of mutual cooperation, the likes of which have not been seen before. 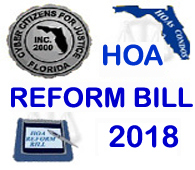 Several current members believe that the Florida Legislature has left many of its citizens behind. You might have a likewise belief? If so, become a member, offer your input and let's find out how effective we can become? While the lobbyists have a serious influence creating and enacting bills that affect our daily lives, we can beat them at their own game if we're organized. That's where YOU fit into the picture. They know that if we're successful organizing statewide, we can and will have an influential affect upon how government adopts its agenda. While the general public can visit and browse through our site to become familiar with the issues we're interested in promoting, the primary business of our organization will be conducted by "MEMBERS ONLY!" 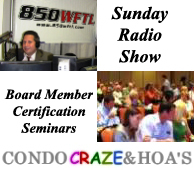 We have LINKS to various Web sites and will work with other organizations pursuing common goals. Our Web site contains Member Pages which require a password to enter. 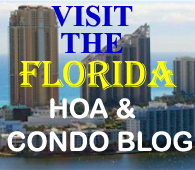 These pages contain: HOA and Condo Education and Information Pages, a Voting Booth, Bulletin Board and other features reserved for Members Only. Very important parts of any organization are its Committees which brainstorm ideas and bring to the membership for a vote. We've started with some basic committees based on the expertise of our current members and issues in which they've expressed an interest. When you become a member you should consider volunteering to serve on a committee or suggest creating a new committee for worthwhile purposes. This represents a wide range of possibilities. Of course, it takes dedicated members to pursue any and all issues. That's where you'll fit in to help us influence our government. Our Web site will be up and running 24/7. No more driving to board and/or membership meetings. No dictatorial Board decisions, since the membership can vote on motions on our "MEMBERS ONLY!" pages. Submit your suggestions by computer! Easy teamwork where every member's special knowledge can help. No telephone, gasoline, hotel accommodation necessary. Well, you've read the basic concept. Now make time to browse our site and please don't forget to subscribe to our E-MAIL LIST and click on the JOIN button to print your membership application. Welcome Aboard!